We have republished this issue with some corrections in red and additions. Please note that the Family Photo event at the Wynne-Russell has been cancelled. Also, the deadline for the coloring contest is Monday, Nov. 16. We have also added information on the Lilburn Citizens Police Academy for 2016. This month's issue gives you a sample of news, events and celebrations for the coming weeks. If your organization or business would like to add to it, send us your item in a Word document by Nov. 15 for publishing around Nov. 20. Thurs. Nov. 12, Wynne-Russell Pres. Comm. 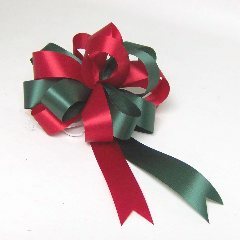 Learn to make the bows that you’ve been paying big bucks for and make all of your Christmas presents really special. Jimi Taylor of Taylor Made Gift Basket Consulting will be offering a class 10-11:30 am Saturday, Nov. 21 at the Wynne-Russell House in Lilburn. Materials will be provided to make three bows and all you need to bring is a pair of sharp scissors. 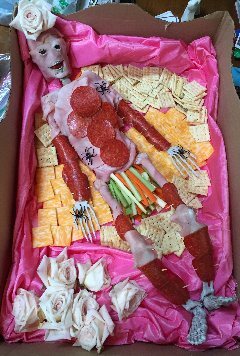 Class fee is $10 which includes materials for three bows and a light snack. All proceeds benefit the Wynne-Russell House. Class size is limited; please register on-line at: www.lilburnevents.com or info@lilburncp.com. 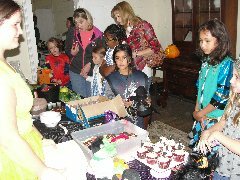 Last year's successful Cookie Swap and Craft Sale will return on Saturday, Dec. 12 from 9:00 am until 3:00 pm. Come with your favorite cookies to swap and then stay for browsing the crafts and baked goods ... or just come to browse the crafts. We'll have a sampling table and hot cider. Cookie Swap guidelines: No charge. Bring 2 ½ dozen cookies, minimum of 2 inches in diameter on a tray with tongs and copies of the recipe to share with the baker's name and contact information. Cookies must be baked and contain flour. Participants may bring more in lots of 2 ½ dozen. Whatever quantity is brought will be swapped for the same amount minus the ½ dozen which will be donated to the WR House. Take-home boxes will be provided. Advance sign-up is required. We will list participant first names and type of cookie on this page. Contact info@lilburncp.com to register for the cookie swap. 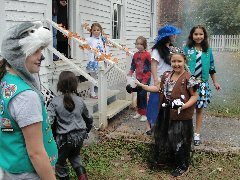 Lilburn area Girl Scouts gathered at the Wynne-Russell House on Oct. 31 to swap home crafted gross goodies. The pictures here and in the Picture Gallery tell the story of these taste-better-than-they-look treats. 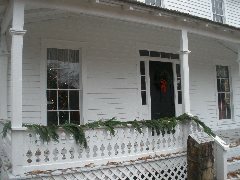 The Wynne-Russell House will be decorated for Christmas this year and will be an ideal location for your holiday gathering of up to 40. Rental rates are $25 per hour with a two-hour minimum. For rental info, contact info@lilburncp.com. 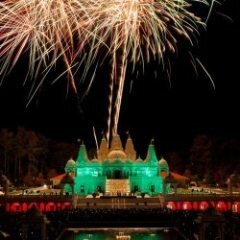 LINK for information on the house and events. The LCP Board will meet at the Wynne-Russell House on Tuesday, Nov. 16 at 8:30 am. Currently the Board is seeking volunteers to help with data entry, graphic design, and as needed volunteers for WR Clean-ups and Events. Plan to come to the board meeting to find out more about what we do or contact us through info@Lilburncp.com. The Wynne-Russell Preservation Committee would like to thank the David and Shannon Byers for hosting and presenting the recent Paranormal Investigation event held at the Wynne-Russell House. The event was a sold out success and netted much needed funds for the historic structure. Thanks also for community support. The Committee will meet on Thursday, Nov. 12 at 5:pm at the Wynne-Russell House. Visitors are welcome. 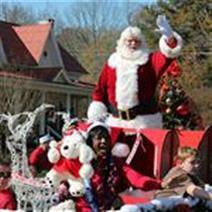 Celebrate the season with this longtime annual tradition in Lilburn. This classic Christmas parade will include marching bands, antique cars, local celebrities, and, of course, Santa Claus! Free, professional photos with Santa will be available at City Hall following the parade until 1:pm. Brian Burchik was elected to Post 1 Council Seat. Mayor Johnny Crist was absent. Mayor Pro Tem Tim Dunn did not vote. 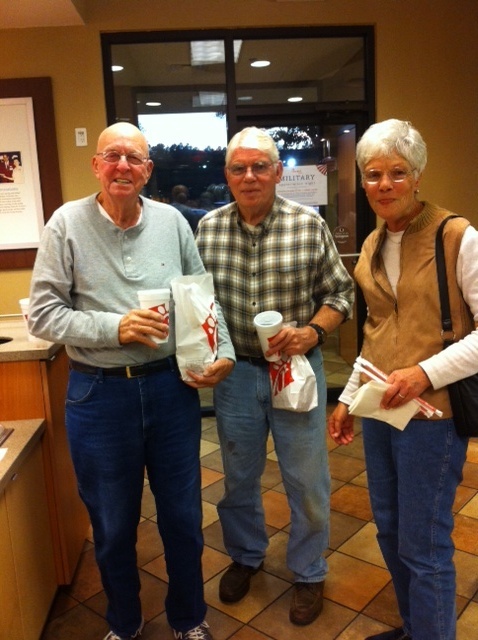 Council members Scott Batterton, Teresa Czyz, and Eddie Price were present. The City of Lilburn will request that the Georgia Traffic Engineering Department review the speed limit ratings on Main Street and Pleasant Hill Road, following unanimous Council approval. City staff recommends reducing the Main Street speed limit from 30 to 25 mph, because the roundabouts are designed for 25 mph speed. 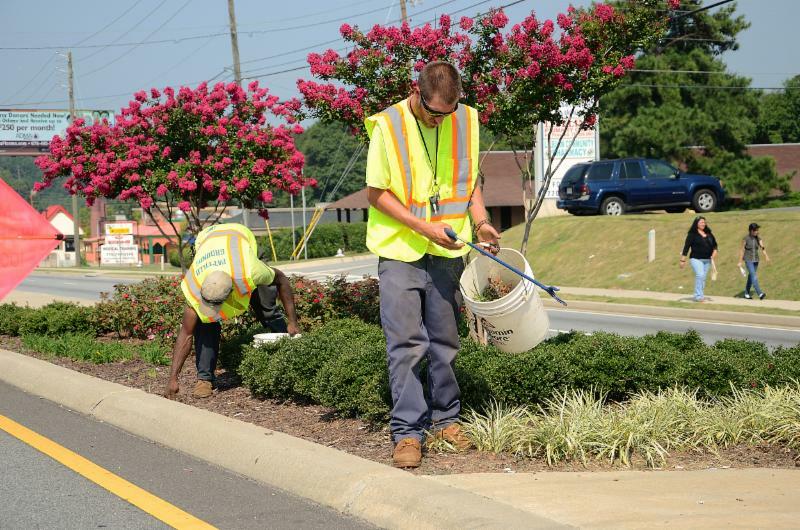 Staff will also ask the state to approve the use of speed detection devices to enforce the existing 45-mph speed limit on Pleasant Hill Road from the city limits to Lawrenceville Highway. Council voted 3-0 to eliminate some fees and penalties in the Occupational Tax Ordinance. There will no longer be a $25 late filing fee and a $125 late payment penalty applied in May. Business license renewal applications are due Jan. 31, and the fee must be paid by March 31. There will continue to be a 10-percent penalty plus 1.5-percent interest charged to delinquent business owners after March 31. Learn more about business licenses. Council unanimously approved an alcohol license for CVS at 5575 Lawrenceville Highway. The location has never held an alcohol license, so council approval was required. Learn more about alcoholic beverage licenses. The Downtown Development Authority is a coalition of business leaders appointed by the City Council to assist with revitalization and redevelopment of the central business district and the Lawrenceville Highway U.S. 29 Corridor Overlay District. Join Mayor Johnny Crist at City Hall for an open forum about topics that interest Lilburn residents. 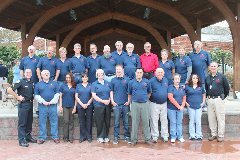 The Lilburn Police Department Citizens Police Academy (CPA) is a 10-week program that meets once a week on Thursday evenings from 6:30 p.m. to 8:30 p.m. This program is designed to provide members of the Lilburn community with additional knowledge about their police department. It allows citizens of Lilburn to become more educated on Lilburn Police Department procedures and the pressures associated with law enforcement. We seek and invite applicants from a diverse group of people who either live in or work in the City of Lilburn. There is no cost to attend the Citizen Police Academy. 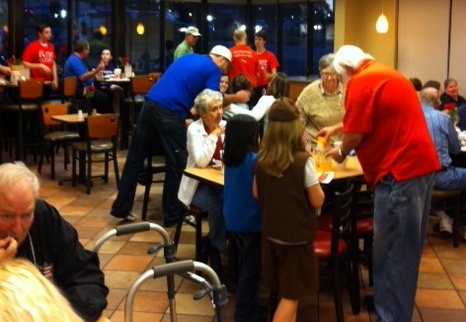 • To provide Lilburn Police Department officers the opportunity to meet and hear from the citizens they serve. Presentations consist of lectures, demonstrations, videos, computer presentations, and "hands on" participation. Each participant is given the opportunity to ride with an officer for one shift. Lilburn Police Department CPA members are given a realistic view of the Department. 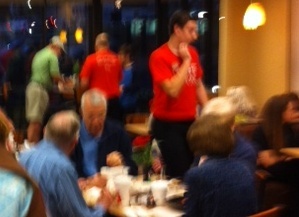 The Lilburn Chick-fil-A showed its true red, white and blue patriotic colors this evening (Nov. 11) as it treated veterans and their immediate family members to dinner. 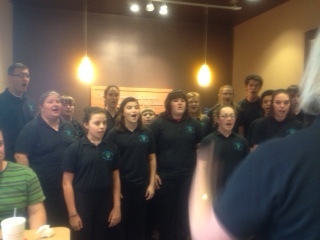 The event kicked off with the singing of the National Anthem by the youth choir of Good Shepherd Presbyterian Church. 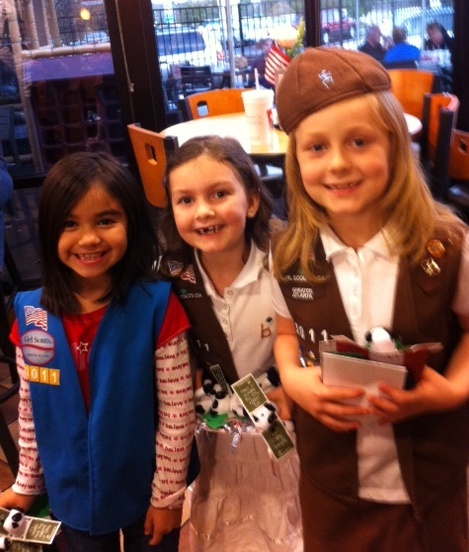 As veterans and their families entered the restaurant they were greeted by Brownies of Troop 3011 and Girl Scouts of Troop 3067 from Camp Creek Elementary. 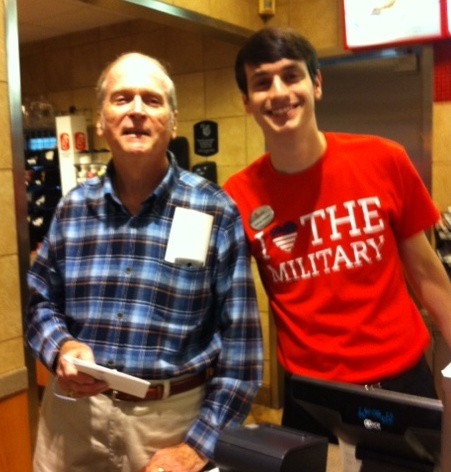 Chick-fil-A staff proudly wore their red I Love the Military shirts as they ushered the Vets to their decorated tables and then brought meals on trays. 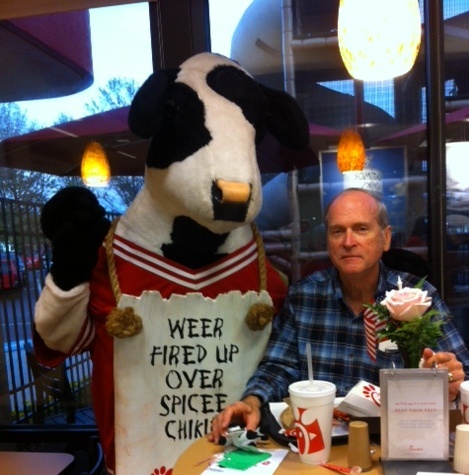 And no Chick-fil-A would be complete with out one of the famous Cows showing up to love on the Vets. 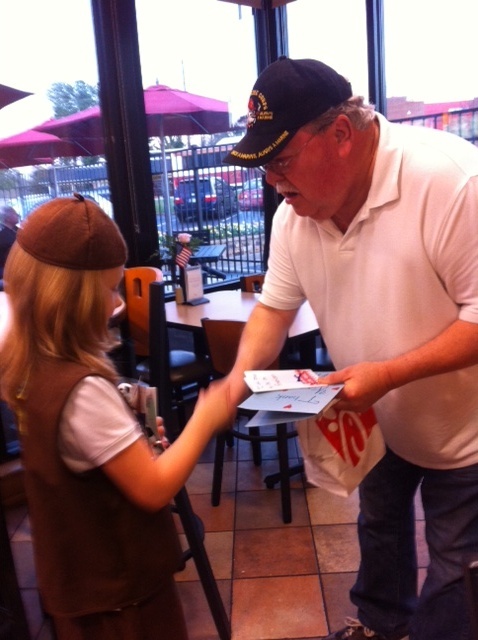 Thank you Lilburn Chick-Fil-A! 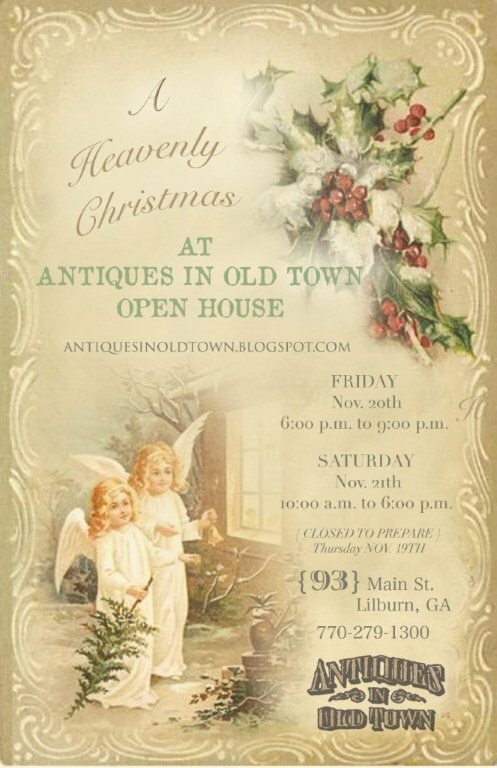 Get in the holiday spirit for a "Heavenly Christmas" at Antiques in Old Town, 83 Main St. on Friday, Nov. 20 from 6 pm - 9 pm and Saturday, Nov. 21 from 10 am - 6 pm. The shop will be decorated to give you that back-in-time experience with all the sights and smells of the Christmas season. While it was sad to see the signs at 79 Main St. announcing that Main Street Market was closing, it's great to see that Bruce and Marie have relocated their business in a space in Antiques in Old Town. Note the following from their Facebook page: "We have officially relocated. 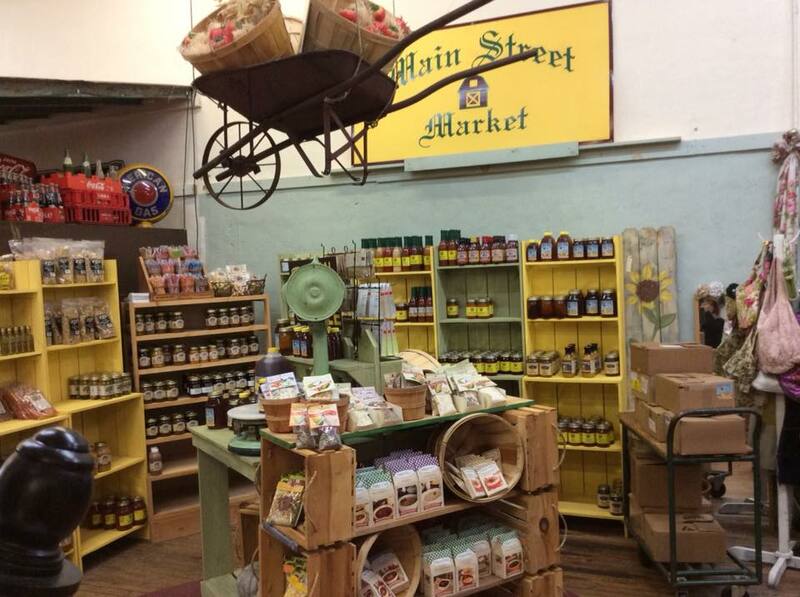 Main Street Market is now located inside Antiques in Old Town, 93 Main Street, Lilburn. We are grateful to have the opportunity to remain in Old Town to serve you. We will continue to carry Honey Creek local honey and local Stone Mtn. 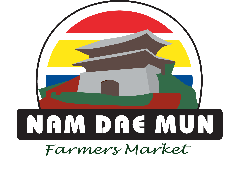 pecans as well as our Amish line, our Main Street Market local line, pecan oil and soups (don't forget the popular Frontier line is gluten free, low sodium)." See more on their Facebook page and stop by to see for yourself. Shopping local is for business owers, too! The holidays are hovering just weeks away—and Small Business Saturday (November 28, 2015) will be here in a flash. But, according to an online Manta poll, 57% of small-business owners haven’t heard of this shopping day. And maybe even more concerning, 69% of small-business owners said they would not be supporting other small businesses this holiday season. Shocking? We thought so. Mo’ money. Why let money slip out of your local area? Keep it in your community. Shopping small keeps over half of every $100 you spend right in your backyard. This positively affects schools, safety, roadways and so on. It’s a win for everyone. Pay it forward. Every small-business owner spends money and time marketing and advertising their brand—but what better way to show others they should be shopping small than by doing it yourself? And supporting fellow small-business owners will likely bring more business to your door. You scratch their back, they’ll scratch yours. Small Business Saturday: Why let Black Friday and Cyber Monday get all the glory? For the millions of small-business owners that participate in this high holiday of shopping, there are often great deals and offers (just like at big box stores). But shopping small gives you more. Avoid overworked salespeople, obnoxious crowds, and risking life and limb. Instead, opt for better customer service, a unique gift, investing in your community, and your sanity. Lunch will be ordered from the lunch menu ($8.99 entree, salad and drink). The Lilburn CID Board of Directors will meet on Friday, Nov. 13 beginning at 8:30 a.m. Unless otherwise posted, the Board meets at Providence Christian Academy (high school building) - 4575 Lawrenceville Highway. 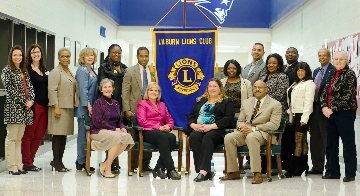 The Lilburn Lions Club would like to invite those interested to attend this month's meeting on Thurs. Nov. 12 at noon at the Taste of Paradise Restaurant located in the Market Place Shopping Center at 4805 Lawrenceville Hwy. in Lilburn (intersection of Indian Trail Rd. and US 29). On Thurs. Dec. 3 at 6:30 pm we will have a social pot luck at Berkmar Middle School, located opposite the Post Office on Hwy. 29 at the traffic light at Postal Way. Note that the December meeting date is not consistent with our normal 4th Thursday meeting time. We will resume our regualr 2nd and 4th Thursday meeting schedule in January. For information on Lion's Club International, please follow this LINK. The Lilburn Woman's Club is getting ready for their annual Christmas Dinner and Auction on Thursday, Dec. 3. The annual event, which takes place at 6:30 pm at Mt. Carmel Christian Church, raises money for the needy in the greater Lilburn area and is always a sellout. 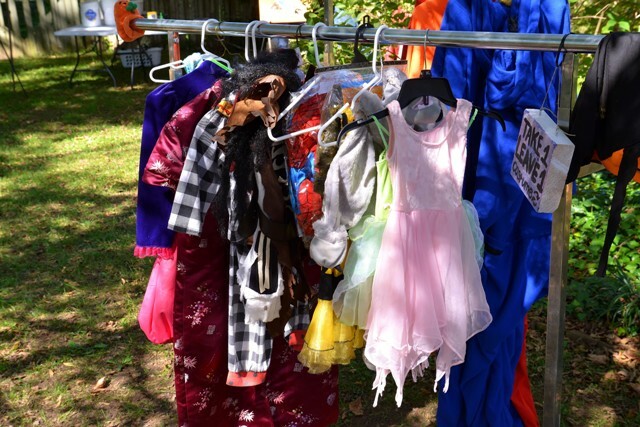 Contact mandymcmanus@hotmail.com by Nov. 23 for ticket availability or to donate items. The Tucker Civic Association is holding its Veterans Job Fair at Rehoboth Baptist Church; 2997 Lawrenceville Hwy, Tucker, GA 30084 on Thursday, Nov. 12 from 10 a.m. to 3 p.m. The fair will feature information on veterans’ services as well as complementary résumé critiques and on-site printing. 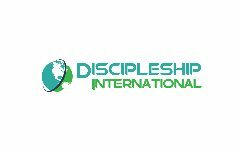 there will be a host of employers attending, such as Goodwill of North Georgia, Rockdale County Sheriff's Office, Georgia Department of Labor and big-name companies such as Delta Air Lines and institutions of higher learning like Emory University and Georgia Perimeter College. During the recent ESPLOST vote, 23,692 residents voted at their precincts; 317 voted absentee by mail; 1213 voted advance-in-person for a total of 25,222 total votes cast. Yes votes totaled 18,838 (74.69%) and No votes totaled 6,384 (25.31%). Celebrate America Recycles Day with the Solid Waste and Recovered Materials Division on Saturday, November 21, 2015, from 9:00am to noon at Coolray Field, home of the Gwinnett Braves, in Lawrenceville. This free event offers paper shredding, as well as electronics, tire, toner/printer cartridge, and paint recycling. In addition, bring your old sneakers and gently used clothing to be donated to those in need or to be recycled into new products. Come for free kids' activities, including touch-a-truck, and meet your haulers. In particular, seeking help from knowledgeable parties can be invaluable if you face the situation of looking for senior care at a distance: community organizations in the area where your parent lives; online resources like theEldercare Locator; groups like the local area Agencies on Aging; professionals like elder law attorneys; andsenior care referral services like A Place for Mom. Any and all of these can help you determine what kind of senior care will best fit your loved one’s needs and budget. 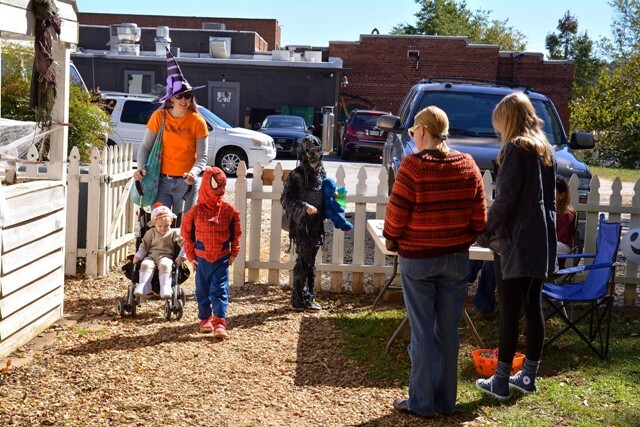 Open House on Main St.